The announcement ratchets up the war of words between the two companies, following a complaint from Google earlier this week that Microsoft's Bing search engine was appropriating its search results to improve its own. By adding H.264 video playback back for Windows Chrome users, Microsoft's Dean Hachamovitch, the head of Internet Explorer development, said his company hopes to bypass a series of significant issues raised by Google's WebM strategy, related to intellectual property liability and risk, the open development of web standards, and simple video playback consistency. Google itself announced plans to promote WebM via web plugins for Internet Explorer and Apple's Safari browser two weeks ago, making Microsoft's alternative proposal a straightforward neutralization of Google's strategy. Microsoft and Google, along with Apple, Mozilla and Opera, have been working for years to address the issue of how best to deliver video on the web. The newly emerging HTML5 specification enables publishers to simplify web audio and video embedding using media tags that hand raw multimedia content to the browser for playback (just like JPEG or PNG graphics files), rather than relying on a separate plugin architecture such as Apple's QuickTime or Adobe Flash to handle multimedia. 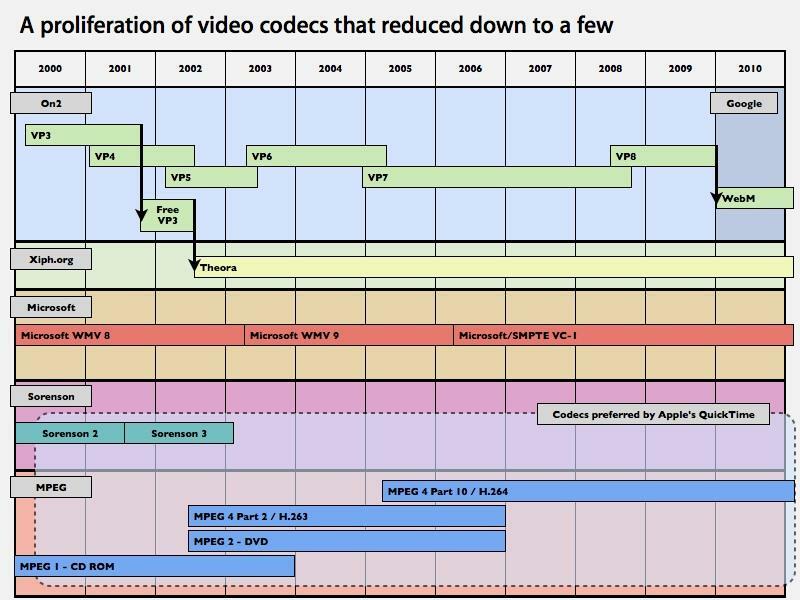 Commercial software vendors, including Microsoft and Apple, favor using the International Standards Organization's MPEG H.264 video codec, a mature and sophisticated specification developed by the technology community and offering consistent playback across the web, PC desktop and mobile devices because it is well supported by existing hardware. Other MPEG stakeholders, from Nokia to Sony (and realistically, every hardware maker), also favor H.264. However, free software enthusiasts, principally Mozilla and Opera, have been pushing the case for Ogg Theora, a rival codec that is distributed by an organization that (unlike MPEG) does not charge royalties for its use. Ogg Theora isn't nearly as mature or as sophisticated, resulting in far less efficient distribution and a very limited use scenario only appropriate for low quality web videos. Until last year, the situation appeared to be resolving itself as the market picked H.264 as the de facto standard for delivering HTML5 video. But last summer, Google threw fuel on the embers of the debate by acquiring the original developer of the proprietary codec that became Ogg Theora and releasing its newer sibling codec (VP6, rebranded by Google as WebM) as a new royalty free alternative to H.264. While enthusiastically embraced by Mozilla, Opera and Wikipedia, most commercial vendors demonstrated no interest in switching to or even adding support for WebM in their HTML5 video distribution plans. Three weeks ago, Google announced plans to remove H.264 video playback from Chrome in an effort to push WebM to gain traction, again inflaming the situation and casting doubt on the prospects for the future of HTML5 video entirely. Without consistent support for HTML5 video using a codec that every browser can play, video producers appeared forced back to supporting Adobe Flash for H.264 video distribution rather than using HTML5 at all, defeating a cornerstone feature of HTML5: its plugin-free support for integrated media playback. As critics pointed out, this would have no impact on whether H.264 were actually generating royalties, but only really impede the adoption of HTML5 over Flash as the vehicle for video on the web.